"Tnx fr ur rept om. Checks up OK. When you heard me I had just blown my 250 watter and was testing with a 150. The note varied 'cos the wave space relay key was arcing most of the time. Sa. 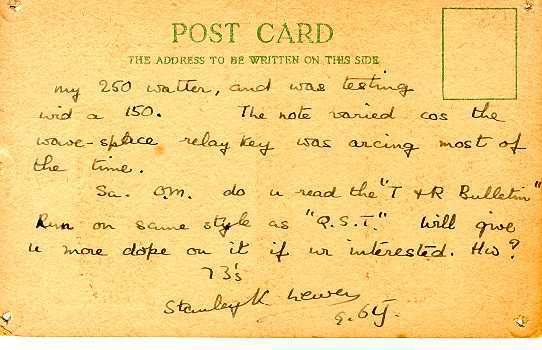 OM, do you read the "T & R Bulletin" run on the same style as "QST." Will give u more dope on it if ur interested. HW?" 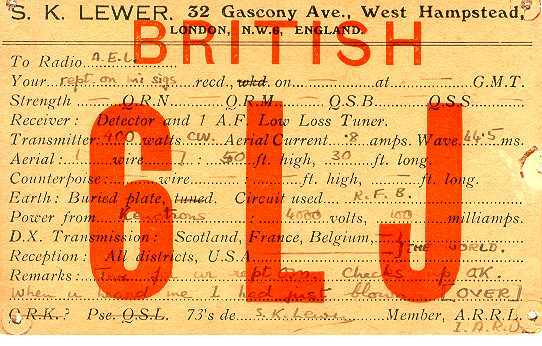 Stanley Lewer represented, with others, British radio amateurs at the first congress of the International Amateur Radio Union in Paris in 1925. (World at their Fingertips p 104-105) The "T & R Bulletin" was the newsletter of the transmitting members of the RSGB at this time. He was president of the RSGB in 1947.